NOW: We’re sweeping our cares away….and headed to Sesame Place! Our first family vacation! We’re taking the almost-7-hour drive down to Langhorn, PA (Near Philadelphia), and spending a few days with Elmo, Big Bird, Cookie Monster, and friends! I am so super excited! We had started talking about going back in March when I first started looking into it. Most people don’t even realize it exists! At the time we decided the kids would be too young, they wouldn’t be able to go on anything, and it was a 7-hour car ride. ’nuff said. But then…..
Tim ignores the pouting. I decide to go online and see if any deals are still going on. I discover BETTER ones! HA! Me: So, there are still deals going on….but only if we book within the next 3 days. Me: Sesame Place! We should go! Tim: But what about all the cons we had last time we discussed it? Me: They’re older now, they love Sesame Street, we had no idea what they would be like 2 months ago, I think they would really enjoy it. So, we look into it. Hotels are buy 2 nights, get 1 free, and you get upgraded to a Season pass, which will get us an extra half-day into the park while we’re there, plus 30% off food and merchandise. Tim agrees that we should go. We book a dinner with Elmo also. Why not, right? So this weekend I started packing. Who knew it would be so hard to pack for 2 2-year-olds? Obviously I had to pack everyone’s clothes and toiletries (including diapers AND potties and underwear). 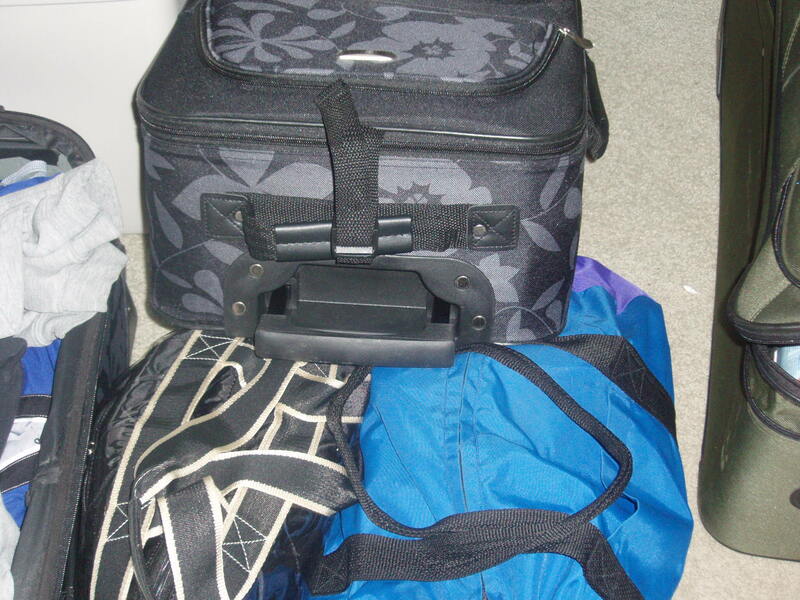 Plus, I have to bring toys and books for them…..what if it rains a day and we’re stuck in the hotel a little while? Plus, these kids get up at like 6:30….Sesame Place doesn’t open until 10. So even taking into consideration breakfast time and drive time, we still will have some down time in the morning. I like to be prepared. Thank goodness we’re taking my car. 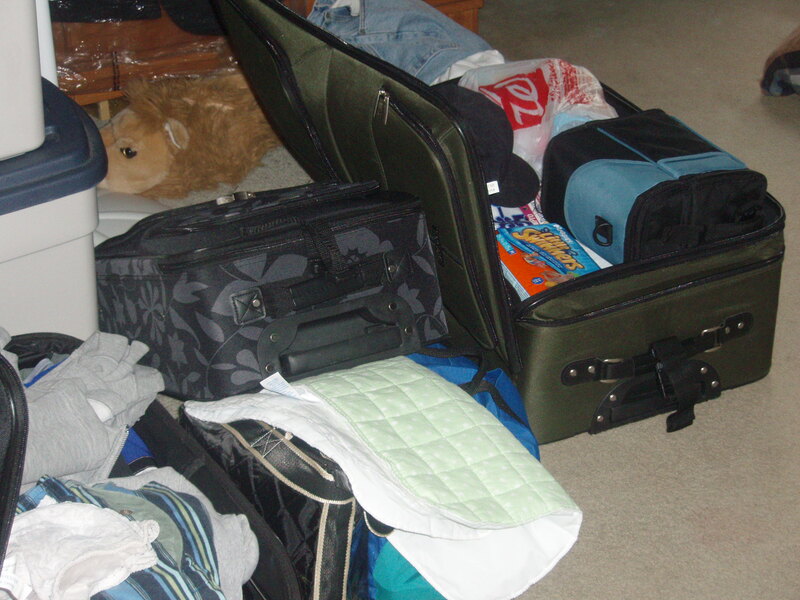 It looks like I packed enough for 4 weeks instead of just 4 days. 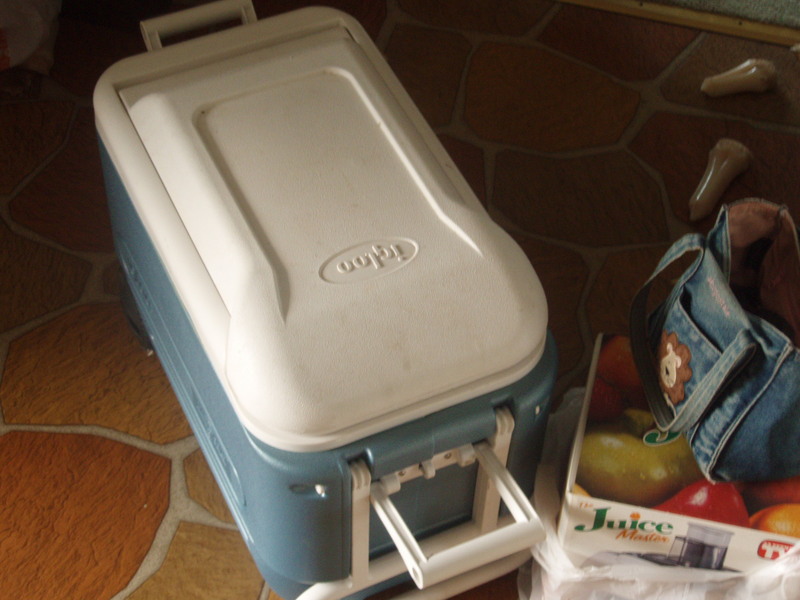 We are bringing a cooler too. Luckily, there is a fridge in our hotel room, so we are bringing a gallon of milk for the kids. But, we need to keep it cold on the way down there, right? So, the cooler. Since we’re bringing it anyway we’re also adding some bottled water, pop, and juice. This will all be used on the ride down, or in the hotel room, or to save a little money in the park. These bags are just for the twins. Clothes, toys, books. And this doesn’t include the diapers, swim diapers, nighttime diapers, and toothbrushes, hair brushes , etc. I also still have to pack their stuffed animals from their cribs, but can’t do that until last-minute. Oh, and the potties too. Well, good thing we decided to take my car. It’s a smallish SUV and at first Tim was against taking it because of the mileage. Then, we compared and realized I was getting just as good a mileage as he was in his sedan. Problem solved. And I’m still not sure how we’re going to fit everything because it’s not like we have the back seat available (2 carseats!). The floor of the backseat can fit a few things. And obviously the trunk. Which already has the stroller in it. Hm…. This will definitely require some Tetris-type skills. 1. – 7-hour car ride with twins that are not even 2 years old. So, we’re leaving pretty early to allow for as many stops as necessary. We originally thought about leaving after lunch so that it would be naptime, but then we wouldn’t be getting to the hotel until dark, and that’s never fun. So, after breakfast it will be. 2. Sleeping. I am just trying to convince myself that if they’re tired they will sleep. Pack ‘n plays are being provided for us at the hotel, but they’ve never slept in those. That’s why I’m brining all of the stuffed animals from their cribs – for a sense of familiarity. I’m hoping. Oh well, too late now. We’ll see how it goes. And I vow not to be one of those parents that’s yelling at their kids throughout the whole trip. What’s the point of that? We’re there for THEM. So their agenda is what we will follow. I’ll keep you updated! We’re bringing the laptop! Question: Are you one of those people who cleans before vacation? Because I am. I don’t want to come home to a messy house. 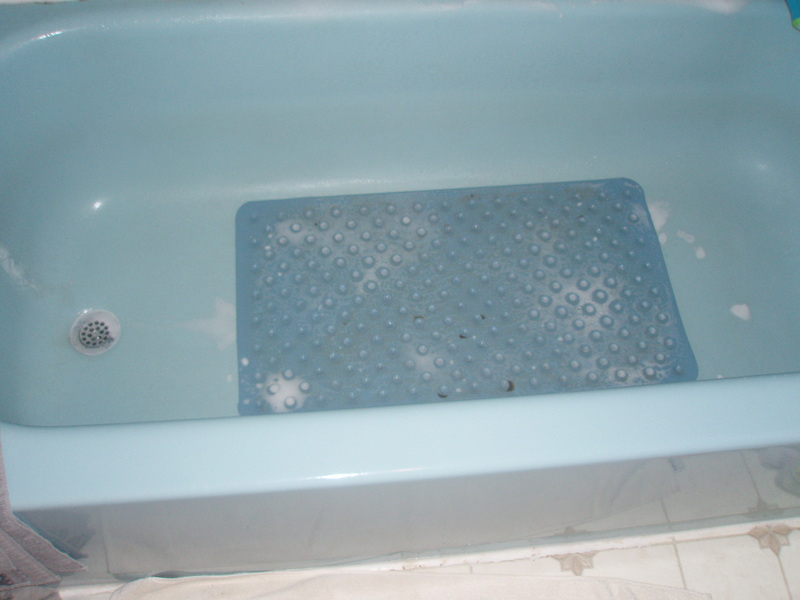 So, I cleaned the tub last night. And I vacuumed. And mowed the lawn. And did some laundry. And tried to just “clean up” in general. This was all in between packing up the car (as much as possible, we do have to put some stuff in right before we left), and normal twin bedtime stuff. Oh! And Tim worked late. What a fun night I had. So worth it when they get to meet Elmo! Oh, and for those of you wondering about the dogs. We are SO SO SO lucky that we always have our families stop by and feed them, let them out, whatever. So my Father-in-Law is staying at our house this time. He has some work he wants to do anyway, so he’ll take care of the dogs at the same time. YAY! THEN: We went on one trip when I was pregnant. To New York City. It was our second time there. Normally, I bring Bonine with me on any trip. I get motion sickness pretty badly and the Bonine works wonders. I especially need it when I go on amusement park rides. (Tim laughed because I packed some for Sesame Place, but I’d rather not take a chance!) Anyway. I was not taking any medicines while pregnant. I was doing anything I could to avoid any kind of medicines. But I really wanted to take some Bonine for the plane ride to NYC. I called the doctor. They said it wasn’t on the “approved” list. So…..it was my choice. I decided not to bring it. I got so sick on the plane. I almost threw up. I was even rummaging around in the little pocket in front of me looking for the barf bag. It was not there. I didn’t want to ask Tim for his because I didn’t trust myself to open my mouth and not puke. I didn’t even want to turn my head sideways to try to catch his attention. It was a particularly rocky landing. I just kept my mouth closed and my gaze even and my breathing short. We had a lot of fun walking around the city for the weekend though. 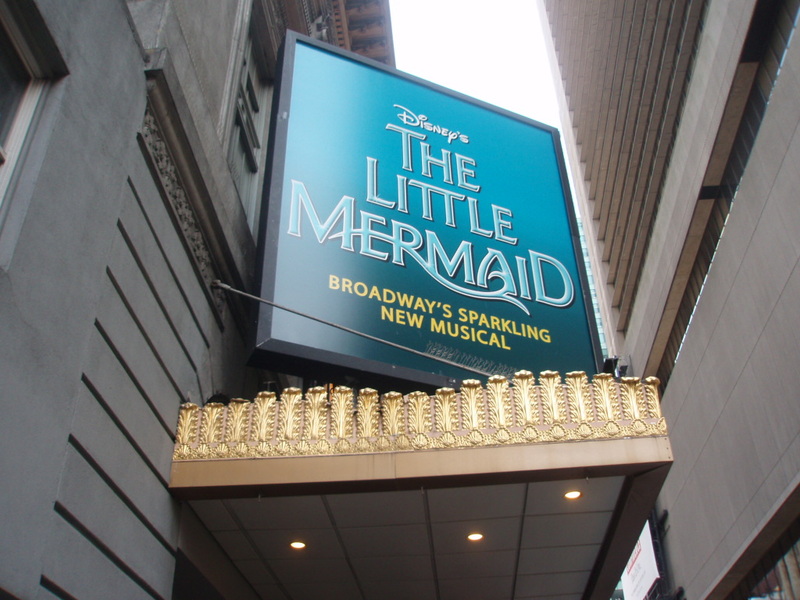 Little Mermaid is my favorite Disney movie, possibly my favorite movie of all time, but it fell a little short on Broadway, so I was a little disappointed. 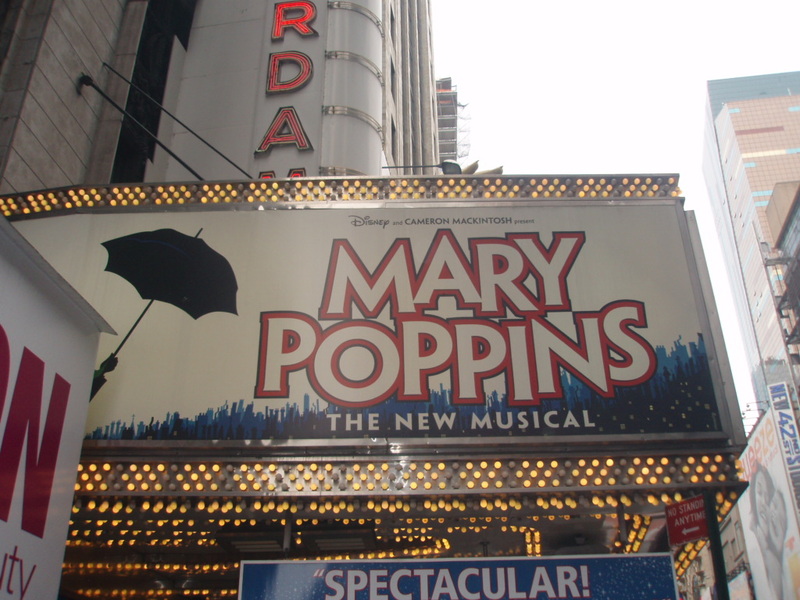 Mary Poppins BLEW ME AWAY THOUGH! We each got a souvenir cup (I use mine for iced coffee now), and we got the unborn twins pins that say “my first Broadway show”. It technically was! We went to some awesome restaurants. 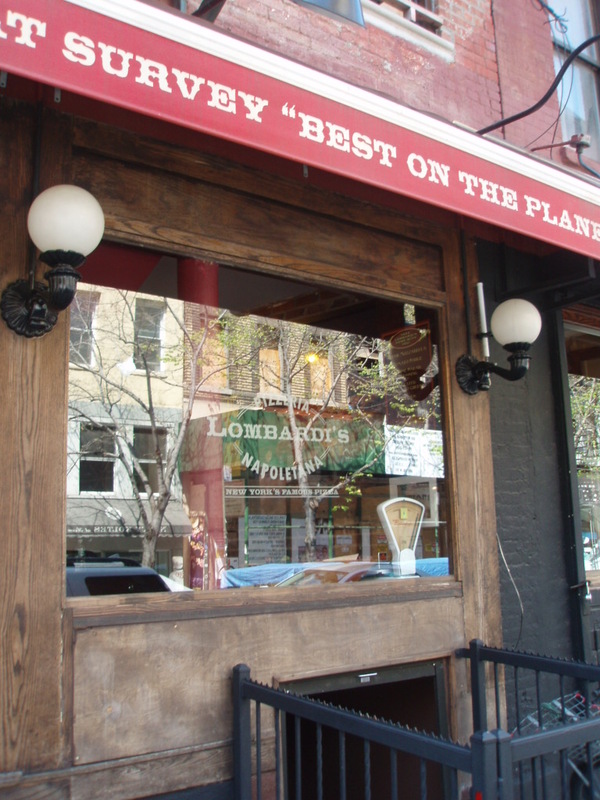 Lombardo’s is one of the oldest pizza places in NYC, it’s in Little Italy. It definitely lived up to its reputation! We’re pretty picky about pizza, and this was extremely yummy! Definitely want to go back. 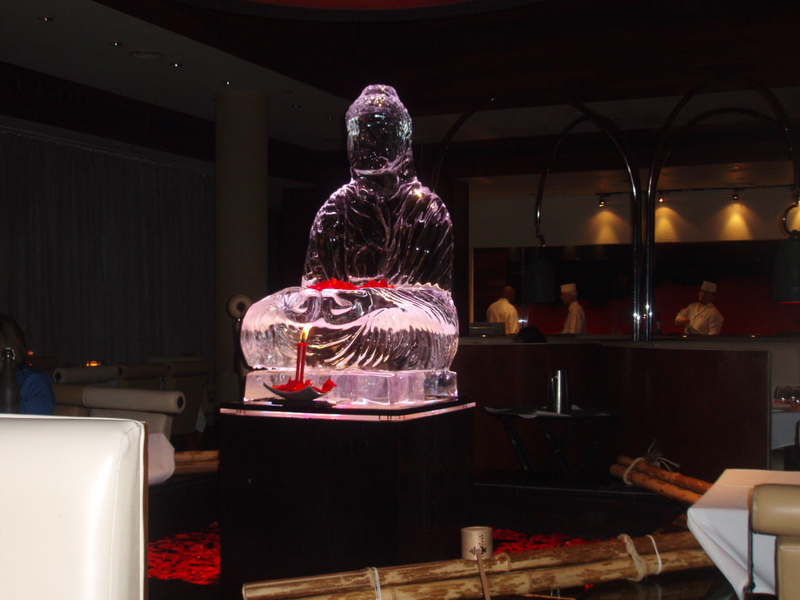 This was a cool ice sculpture at a Japanese restaurant we went to. I can’t remember the name of it and Tim’s not here right now to ask. So, oh well. It was good though. We had American-Kobe beef. It was pretty good, but not as good as the real thing. 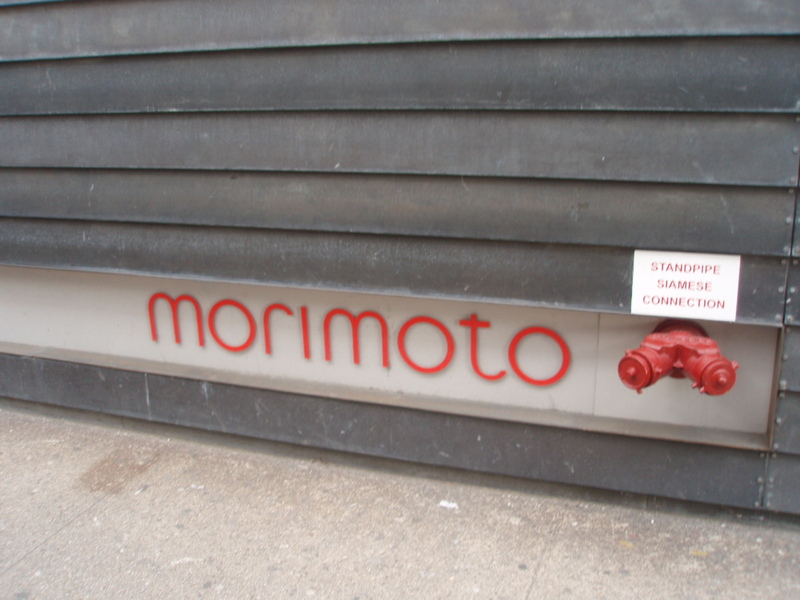 We absolutely loved Mario Batali’s restaurant Babbo when we were in NYC back in 2007. 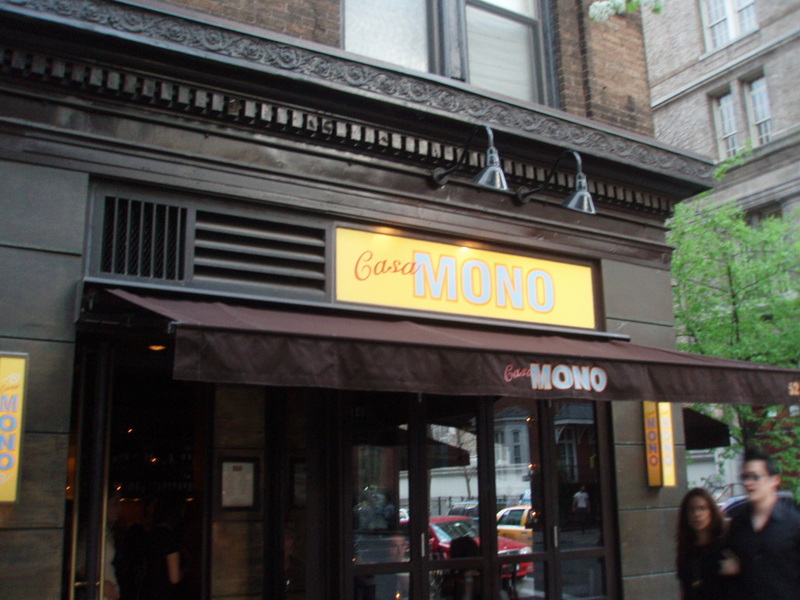 So we decided to try Casa Mono – his spanish restaurant. I don’t know if it was because I was pregnant and uncomfortable, but I really didn’t like the atmosphere. Well, Tim didn’t either, so it wasn’t just me. The tables were very small and crowded together and I just felt trapped. The entire menu is in Spanish and we felt a little funny asking for help. It’s mostly Spanish tapas. The food was ok. Not on my recommended list. The plane ride back was not so bad. I made sure ahead of time that I had a barf bag in the pocket, as well as in Tim’s. I concentrated on the TV show I was watching and tried not to look side to side. I also ate some pretzels that were provided. I don’t know if I would EVER fly while pregnant AGAIN. That was then. 1) Until now I’d never heard of Sesame Street Place. We’ve driven back to visit my family in Philly a few times in the last decade and I’m sure at one point it would have been perfect for the kids. 2) My daughter would be so jealous that you got to see little mermaid on roadway. She was saving up to buy tickets for the 2010 Fall tour that never happened. Perhaps they never toured the show because it wasn’t as good as Lion King, etc has been on Broadway. 3) I know what you mean about the Japanese toilet. When I lived in Tokyo not everyone had something so elaborate (we didn’t), but I remember the first time seeing one and not being brave enough to push all of the buttons which were labeled in Japanese. It’s funny how many people I’ve told about Sesame Place that have never heard of it. An aunt of Tim’s went with her little ones a few years ago and that’s how I heard about it. It was a ton of fun….some rides they couldn’t (or wouldn’t) go on, but maybe we’ll go back in a couple years. Little Mermaid definitely was not as good as Lion King…..I feel like such a traitor saying that!!! It seemed a little like they rushed it to get it out and there were too many plot changes and plot holes. I don’t regret seeing it though. Yeah, I didn’t push all of the buttons either….although they were in English…..but I wasn’t brave enough….I told everyone I did though! It sounded cooler that way. LOL.